Hello, I’m Jim Glover, That Branding Guy, for Once a Day Marketing™. On our radio show That Branding Guy™, we discussed branding and marketing with a non-profit focused on play. Joining us on the show was Kafi Hauser, Director of Marketing & Communication for Playworks, a non-profit based in Oakland, CA whose mission is to ensure that every kid gets a chance to play every day. To accomplish this goal, they share their programs with schools across the country. 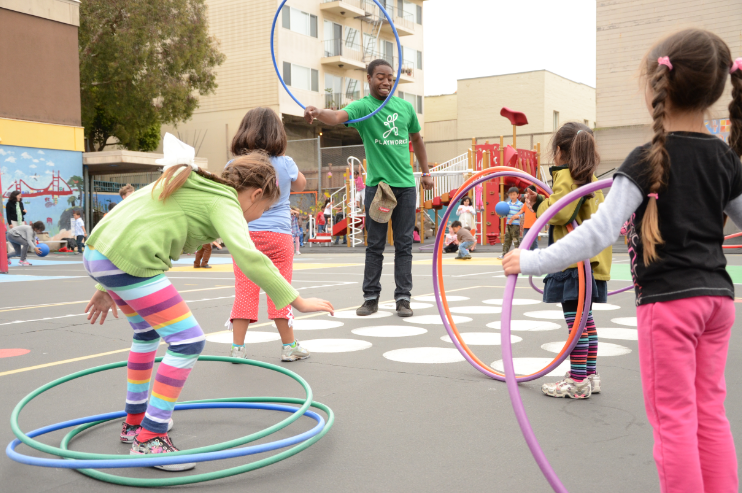 This year Playworks will serve over 1 million kids at 2,000 schools. To further their mission, Playworks focuses on encouraging outdoor activities and they try to make the link between activity and being a strong learner. Kids bring home the skills they learn and share with siblings as well as parents. The impact of Playworks programs include tools that move beyond the playground including increased conflict resolution ability and empathy. Playworks processes include wind-down at the end of recess and play time to transition participants back into a quieter learning environment. Playworks’ target markets include school administrators and principals as well as foundations and individual donors. They engage their audiences through a variety of traditional and social media avenues including email and content marketing. The social media marketing plan is monitored and revised as needed to ensure it is optimized. Kafi shared that even as a large organization their biggest branding challenge is awareness. To increase brand recognition, Playworks is trying a variety of tactics including social media influencers.